As the old song says, “It Never Rains In Southern California”. While Albert Hammond’s song isn’t entirely true — rainstorms do happen here and it’s best to be prepared for them — it’s safe to say that water, as a resource, is of a scarcer variety here than in other parts of the country. In recent years, the severity of the situation has increased substantially, with some studies suggesting that California is facing the worst drought in five hundred years! With that in mind, the Government of California has launched a number of aggressive restrictions regarding the use of water. They are also offering several rebates as incentives for its residents to use water more efficiently. • Watering lawns or landscapes with drinkable water during rainfall, or for 48 hours afterwards, is prohibited. • Using water to wash sidewalks or driveways is prohibited. • Irrigation runoff or overspray onto streets, sidewalks or driveways is prohibited. • If water is used to wash a vehicle, the hose must have a positive shut-off nozzle on its end – in other words, it shuts off on its own. • Fountains or other decorative water features must recirculate the water. • All leaks must be fixed within 72 hours. • Watering of ornamental grass on public medians is prohibited. • Restaurants and other food service establishments may only serve water to customers if it is requested. • Hotels and motels must prominently display that they have the option of not having their towels or linens laundered daily. 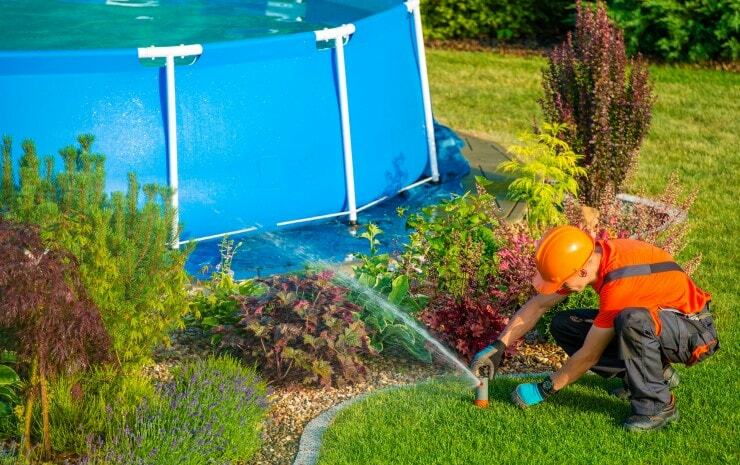 • Irrigation with potable water outside of newly constructed homes and buildings not in accordance with emergency regulations or other requirements established in the California Building Standards Code is prohibited. *Note that watering is limited to two days a week & all watering is prohibited from 9 a.m. to 5 p.m. Although reducing water usage can be challenging, the good news is that there are a number of devices available that help increase water efficiency. Even better, many of these devices may qualify for a rebate, saving you even more money than what you’ll save on your monthly water bill! Below are some of the rebates offered, although these may vary so please verify with your water agency. Using 55% less water than standard clothes washers, High-efficiency clothes washers also use less energy overall, leading to a possible reduction in your energy bill. Rebates for qualified clothes washers start at $85. With the ability to save over $800 in water costs over their lifetime, PHETs can pay for themselves when combined with the rebate. Rebates start at $40 per qualifying model. WBICs automatically adjust their irrigation schedules according to changes in weather, soil conditions and types of plants, resulting in potential savings of over 13,500 gallons of water every year. Rebates start at $80 per controller for less than one acre of landscape, and $35 per station for more than one acre. Note that if you receive a rebate for a WBIC, you can’t receive a rebate for a Soil Moisture Sensor System (SMSS, described below). You have to choose one or the other. With the ability to apply water more slowly and uniformly, rotating sprinkler nozzles help prevent over-watering and encourage the growth of healthy plants. They can also use up to twenty percent less water than conventional fan spray heads. Rebates start at two dollars per nozzle, with a minimum quantity of thirty nozzles. By collecting and reusing rainwater, you can minimize the quantity of water going into storm drains and sewer systems. This water is also better for your plants, as it is naturally ‘soft’, with no chlorine, fluoride or other chemicals. Rebates start at $75 per barrel for up to four barrels, or $300 for a cistern with at least a 200 gallon capacity. Note that homemade rain barrels or cisterns don’t qualify for rebates. An SMSS determines the amount of water the soil needs by measuring the present moisture. It works together with an irrigation controller, stopping and starting your water system based on the needs of the soil. Rebates start at $80 per controller for less than one acre of landscape, and $35 per station for more than one acre. Note that if you receive a rebate for an SMSS, you can’t receive a rebate for a Weather-based irrigation controller (WBIC, described above). You have to choose one or the other. Another way to reduce water usage is by removing turf and converting it to landscaping that is tolerant to droughts, or synthetic turf. This enables you to increase the curb appeal of your home while saving water at the same time. In participating areas, rebates start at two dollars per square foot of removed turf. You may also check with your water agency to inquire about any free devices they may offer, such as aerators for the kitchen or bathroom, tank banks and leak detection tables for the toilet, shower heads and timers, hose spray nozzles, soil moisture probes, or drip gauges. The Metropolitan Water District of Southern California – a consortium of 26 cities and water districts, including parts of Los Angeles, Orange, San Diego, Riverside, San Bernardino and Ventura counties.